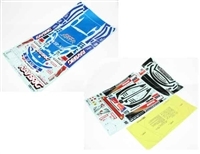 Black print on white mount large numbers in gloss, very easy to identify even in RC racing car number stickers. This sticker sheet is a variation of item 42234 TRF Sticker C (Mirror Finish) and features a stylish Blue border around the lettering. Make your touring car model look even more stylish by adding some decoration to the body. 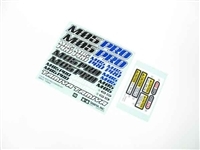 This sticker set includes stripe marking stickers which add a speedy look when applied to the bonnet of the car. It also features designs which can be applied to the side of the car to give the model a customized look. 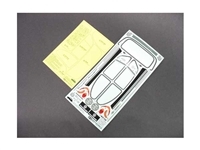 Replacement sticker(s) for VW Beetle M-Chassis R/C Car bodies. Please see item name for vehicle placement. Check your instruction manual for correct sticker(s) part number. 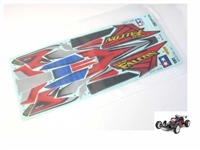 Comes with Sticker Sheet A, B and Masking Seal for Tamiya NSX 2007 Body. 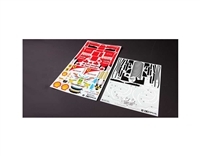 This is the Original Tamiya Body Sticker Set and Masking for Tamiya 49400 Porsche Turbo RSR Type 934 - TA05. 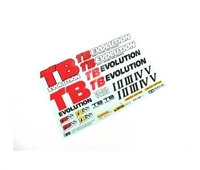 Replacement sticker(s) for R/C Car bodies. Please see item name for vehicle placement. 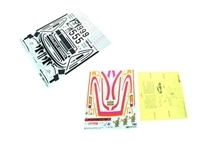 Check your instruction manual for correct sticker(s) part number.